According to some local traditions, the railroad was to have come through Bakersville instead of Spruce Pine, but certain town leaders did not want that to happen. A variety of explanations has been suggested over the years; however, perhaps the truth lies in the following. The story begins with Union General John T. Wilder, who after the war became even more successful financially as a business person, specifically in the area of iron making and manufacture. He was born in 1830 in the Catskill Mountains of New York, but eventually came to live in Roan Mountain, TN. He was known locally for having built the Cloudland Hotel. Obviously never a small thinker, in 1886 he convinced interested capitalists, especially in Boston, Philadelphia, and New York, to invest in a rail line that would run from Charleston, SC, to Ashland and Whitehorse, KY. The intent was to create a faster way to get the coal from the area as well as link manufacturers to lucrative trading centers in the South and to the shipping port of Charleston. The Charleston, Cincinnati, & Chicago Railroad Company, commonly referred to as the 3 C’s, was incorporated by the Tennessee legislature in March 1887 with the company’s office located at 45 Broadway, New York City. The official map from the 3 C’s Company in 1888 shows clearly that the route to be taken lay directly across the town of Bakersville. Some local voices say that Wilder wanted to build a tunnel through Iron Mountain, but there has yet to be hard evidence to support that contention. 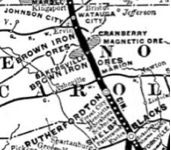 The first consideration for “rerouting” to Spruce Pine is that the Town was first given that name in 1856 and it does not appear on the 1880 Colton map which may well represent the maps used by Wilder and the 3 C’s as they projected the route from Rutherfordton to Johnson City. Bakersville appears on maps as early as the 1830’s. Note also that the route was originally projected to pass through “Ervin” (sic) to Johnson City where construction for that segment began. Work began and by 1893, 20 miles had been laid between Johnson City and Chestoa (Erwin). However, the bad news for 3 C’s that year was that Baring Brothers, the bank from which Wilder’s money was to come, became insolvent. The 3 C’s Company was purchased by a group which renamed it the Ohio River & Charleston Railway Company. Wilder said that he lost at least $750,000 (over $20 million today) of his own money. Wilder moved to Knoxville, TN, in 1897 after receiving an appointment from President William McKinley as a Federal pension agent, then was commissioner of the Chickamauga and Chattanooga National Military Park. He died in Jacksonville, FL, aged 87, while on his annual winter vacation with his second wife, Dora Lee, and was returned for burial in Forest Hills Cemetery in Chattanooga with his first wife, Martha Jane Stewart. Under the OR & C, the rail line reached Huntdale in 1899, Toecane in 1901, Boonford in 1902, and Spruce Pine in 1903, bypassing the town of Bakersville by about 2 miles. Map showing the proposed route of the railroad.